Do you want beautiful music for your wedding or event? 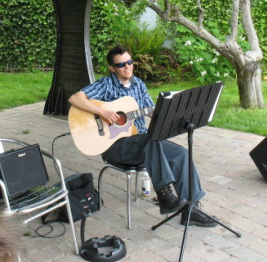 Quinn Fitzpatrick is a wedding and special event guitarist based in the Pacific Northwest and California. Quinn Fitzpatrick is an eclectic guitarist who draws upon folk, country, celtic, pop, rock, blues, hip-hop, r&b, bossa nova and jazz. He plays tasteful instrumental arrangements of classic tunes from the 20th and 21st centuries as well as original compositions. Influences include Tuck Andress, Tommy Emmanuel, Pete Huttlinger, Antonio Carlos Jobim, Andy Mckee, and Jimmy Page. Quinn has played with a variety of musicians and successful SF bay area bands opening for artists such as Kenny Chesney, Rodney Crowell, Aaron Tippin, Jimmy Smith, and many more. After a successful career both playing and teaching guitar in the San Francisco Bay Area, he relocated to Whidbey Island, Washington to focus on composing, recording and promoting his solo fingerstyle acoustic guitar music. He currently divides his time between Northern California and the Pacific Northwest. Described as a “poet of sound” and a “guitar wizard” with a "Ph.D in clean tone", Quinn’s music covers a wide spectrum of emotions and styles. Want to play guitar today? Guitar made easy for all ages and levels! 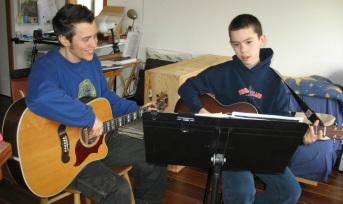 Quinn has taught guitar for over 15 years from elementary schools to Universities. Quinn has been teaching private and group guitar lessons in the San Francisco bay area for many years. He has taught at both University of California in Berkeley and California State University East Bay. Quinn has been teaching in the Seattle and Whidbey Island area for the past 7 years. He has taught at several Community Colleges in Seattle, Portland, Oregon and the Front Range Community Colleges in Colorado. Quinn has also been a guest guitar instructor at Antioch University in Seattle and at local high schools. 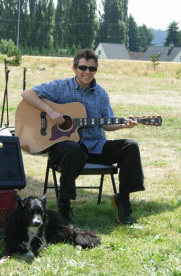 He currently teaches guitar privately to students ages 6 to adult both online and in person in Washington, Oregon and California. He is a versatile, encouraging and patient instructor who enjoys teaching all styles, ages and levels. Quinn’s intent for every student is to have a solid foundation, be inspired and play the music they love.